Standing at the forefront of the ever-growing West-coast house & techno movement in the US is Ben Seagren – DJ, Producer, and visionary contributor within the Burning Man community. 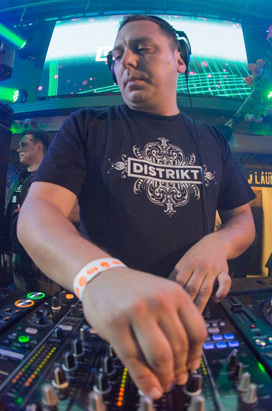 Ben is best known for his dual roles as co-founder and resident DJ of DISTRIKT recognized as the staple party experience of the Burn for its reputable artist roster, beautifully positive crowd experience and definitive, cutting edge sound. Playing host and DJ to well over 30,000 guests every year during one magical week in the desert, it comes as no surprise that Ben and his DISTRIKT moniker continue to entertain thousands of fans and followers all over the world. While traveling constantly between Los Angeles and San Francisco, Ben regularly plays events up a down the California coast at Public Works, Audio, Spin, Avalon & Sound and has held court at Ayslum After-hours in Honolulu, Flash & uHall in DC, Output in New York, Heart in Miami and Nikki Beach Cabo San Lucas, to name a few. He is also constantly organizing DISTRIKT events while performing over 100 gigs per year in clubs and festivals across the world. Ben has been a guest performer at the BPM festival in Playa del Carmen, Lovebox in London, Lightning in a Bottle, Symbiosis & of course Burning Man. In 2014 Ben made his debut on world renown Chus & Ceballos label Stereo Productions. The first release was a remix of a big room banger “Blowin Minds” by Chus & Ceballos that reached far and wide. It even got played out by Joseph Capriati at the BPM Festival in Playa del Carmen. Following up this dance-floor killer he remixed Tony Dee’s track “Back in the Dancefloor” on his latest Burn EP with Oscar L. Ben just finished up another remix on Stereo called “Black Rock City”. The original track was produced by Chus and Ceballos right after their first experience at Burning Man. It is an honor for Ben to remix this track 2 years later for a festival that is such a huge part of his life. Black Rock City will be released in the upcoming months so keep an eye out! Ben’s First EP “Deep in Your Soul” released September 1st 2014 on Selected Records from Spain has been getting support from industry heavyweights such as Marco Bailey, UMEK, Mark Knight, Just Be, Marco Carola, Richie Santana, Arjun Vagale, Peter Bailey, Rob Mirage, Danny Tenaglia, Victor Calderone and many more. Italian techno legend and Deeperfect Records boss Stefano Neforini also supported the track on two episodes of his podcast “Club Edition 102″ The release was also listed as a “Beatport Staff Pick” for September. His first Beatport release, “Calling Me” on acclaimed Spanish label BeatFreak Recordings, (a massive big room techno banger) currently climbing the Beatport Top 100 techno chart, and is destroying dance floors internationally with support from contemporaries Victor Calderone, Carlo Lio, The Junkies, D-Formation and co-collaborator Richie Santana.